News is coming in this morning that last year’s Defensive Player of the Year, Baltimore Ravens linebacker Terrell Suggs, has torn his Achilles tendon during a game of hoops and will be out for the entire 2012 NFL season. Suggs (affectionately known as T-Sizzle) had a career year last season for the Baltimore Ravens, leading their defense. He was a major factor in getting them to the AFC title game and then won the NFL’s top defensive award as a result. Suggs racked up 70 tackles and 14 sacks, and was a dominating force. 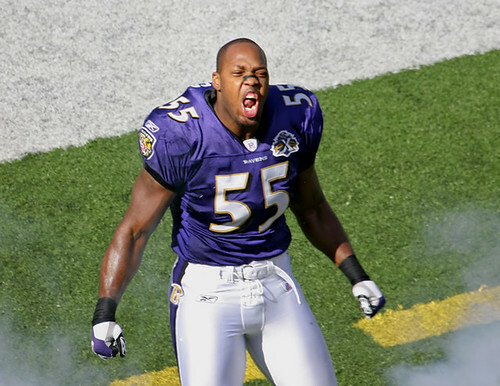 The Ravens have a lot of depth at the linebacker position, but losing a sack monster and emotional leader like Terrell Suggs for the season will leave a big hole to be filled by younger LB’s like Kindle, Kruger and Upshaw.